From the noise outside my window I thought it was another protest march, but then I heard the guy on the bullhorn say something like “elephants,” so I ran to the window in time to catch a line of elephants plod by, scantily clad women atop them, a parade of marchers and drummers in tow. 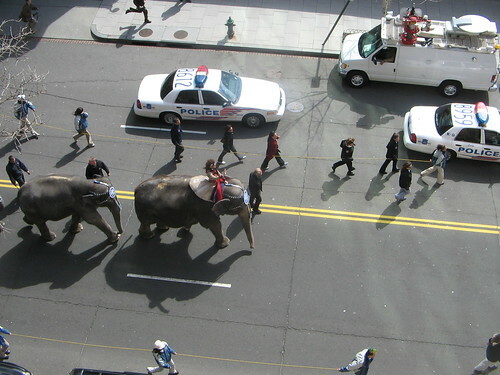 It was the Ringling Bros. Barnum and Bailey Circus’ Pachyderm Parade, going down E Street towards Gallery Place to set up the circus. Update: Video here on DC Metroblogging. When I was pastoring my first church in small-town Mississippi, the congregation seemed pretty smallish one Sunday AM, and then the rest of the usual folks came in at once about 15 minutes past the hour. I found out afterwards why so many folks were tardy: Ringling Bros. Circus train was going through town on the tracks about a half block from the church building! Yeah, nothing like a few pachyderms to break-up the monotony.